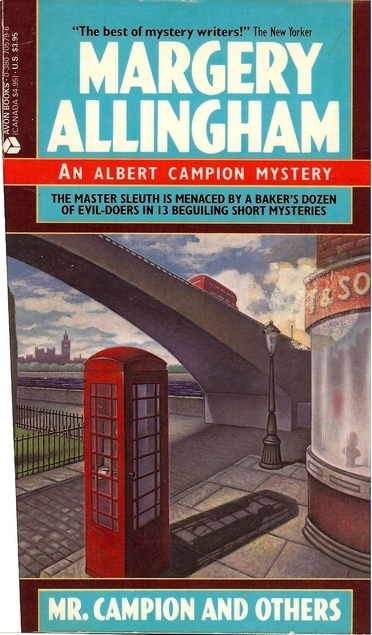 A baker’s dozen of Albert Campion short stories, which are often where both he and Allingham’s writing shone most brightly. What could be better? There is a sense of fun and playfulness here, and most of the stories are not terribly burdened by drama: these are certainly set pieces of a specific period, essentially the inter-war years. This is a world which would not exist again following the conclusion of the Second World War, and in many ways the portrayal of Campion changed during and after the war, while similar figures – Lord Peter Wimsey springs to mind – never evolved because the decision was taken not to send them forward in time (in Wimsey’s case, Sayers all but stopped writing the character after 1938’s Busman’s Honeymoon). Nearly all of these tales also involve Mr Albert Campion in a rather avuncular role, as befits a man nearing his 40s (in the chronology, Campion was born in 1900). Here, he is not a love-interest or the dashing hero, as in the books of the earlier ’30s (Look to the Lady, Mystery Mile, for example), but rather a friend to this and that young society-girl in her early twenties, all of whom seem to be affianced to men Campion knows to varying degrees. In each of the cases, Campion is aided by Chief Inspector – later Superintendent – Stanislaus Oates of the Yard, although sometimes the two characters seem to be somewhat at odds: their relationship is seemingly fractious from time to time, but the men never lose their affection for one another. The entire collection is a solid and enjoyable work, but there are some obvious stand-outs: “The Hat Trick”, “The Old Man in the Window”, “The Frenchman’s Gloves”, and “The Meaning of the Act” are particularly intriguing; the last-named especially I would have enjoyed seeing expanded into a full-length novel, as it was a fascinating premise. Brilliant, thoroughly enjoyable, and over too soon. Four-and-a-half of five stars. Originally reviewed 15 September 2014. Find your copy of Mr. Campion and Others at AbeBooks.com. This entry was posted in Authors-Allingham Margery, Book Reviews and tagged 1930s, 20th Century, British Writers, Mystery & Detective Fiction, Short Stories. Bookmark the permalink. Like the sound of this. One to get! I’d definitely consider any of Allingham’s volumes of short stories. I will review another soon.